The corner of my entryway is a bit dark and well, boring. 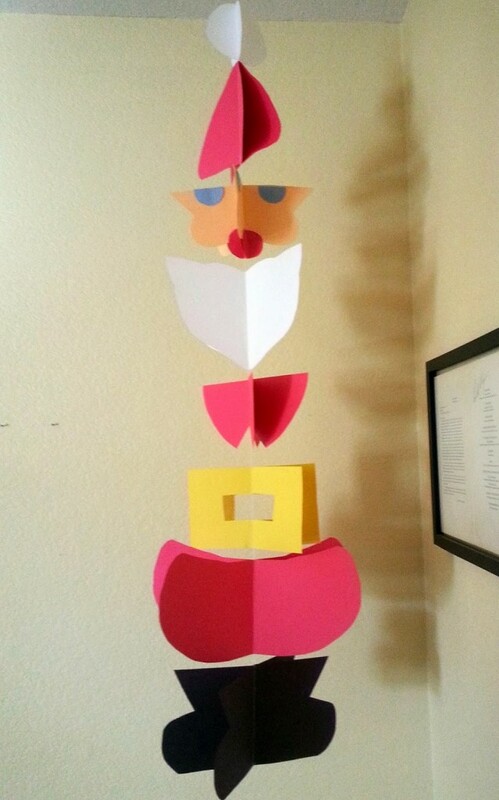 When I put up all my Christmas decorations I came across this Santa mobile made from sewn construction paper. It was falling apart so I remade it. I even made a pattern that I had every intention of making into a printable to share with you all. But, it didn’t get completed in time for Christmas. On Tuesday it was the last Christmas decoration I needed to take down. But, I wasn’t go to all of the effort to drag a chair over there and climb up to take Santa down unless I had a new one to put up. So, with my first “child-free” time on Tuesday I grabbed some construction paper and made up this one. Decorations from T to B – construction paper flowers, crinkle cut scissors, open heart, the scrap from the open heart, cut outs from napkins and red glitter glue. The only problem occurred when I sewed up the empty big white heart. Originally it was going to be completely empty, but it was such a big empty space that I didn’t keep the heart flat enough going through the machine. When I finished the top and bottom were too close together and it looked like it might rip if I tried to hang it. So, I snipped that thread and added the pink stripe in the middle. I like the extra color and the security it provided. I am not going to bother giving you a pattern, because I am assuming you can free hand a heart as well as, if not better than, I can. For the pink and purple ones, I folded the paper vertically and cut two smaller hearts. You can make them all identical size and shape if you prefer. 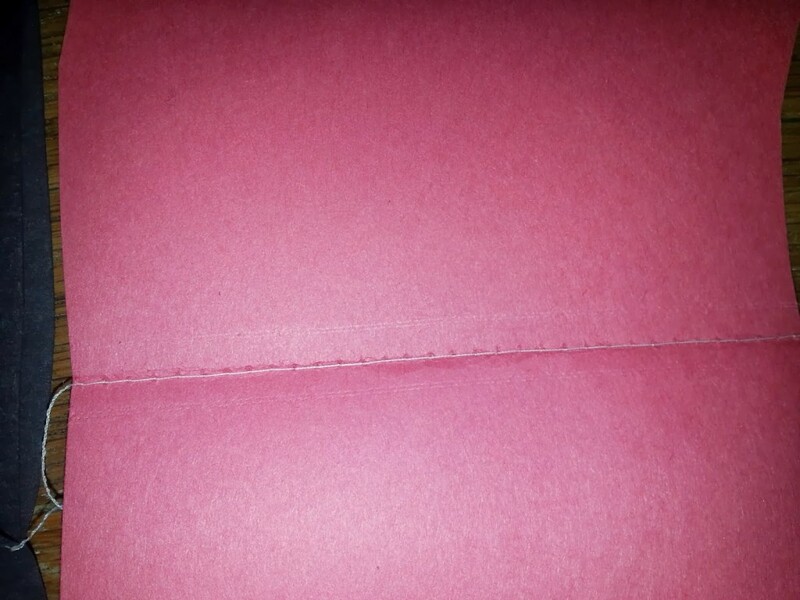 In total, mine used 2 sheets each of pink, white, red and purple 9 x 12 inch construction paper. 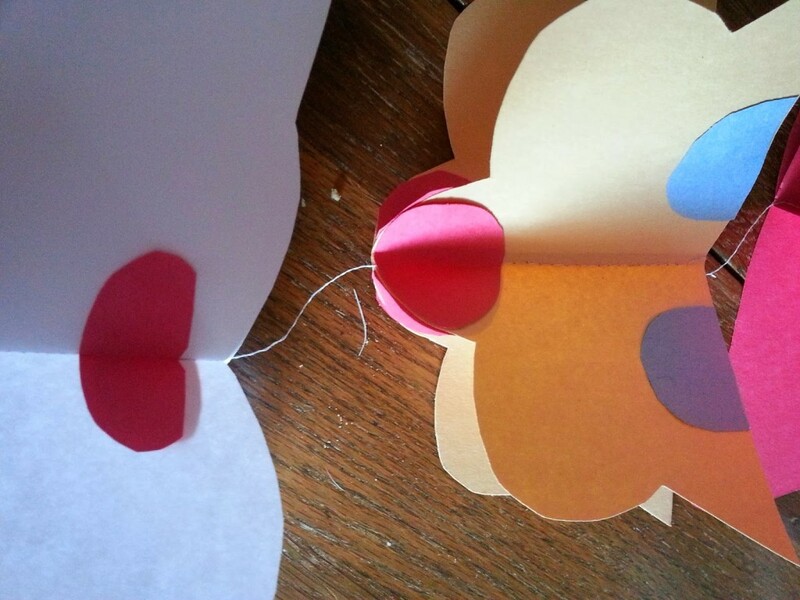 construction paper of different colors – 2 for each heart. decorating materials – construction paper scraps, glitter, stickers, napkins, heart shaped doilies, etc. – use your imagination. 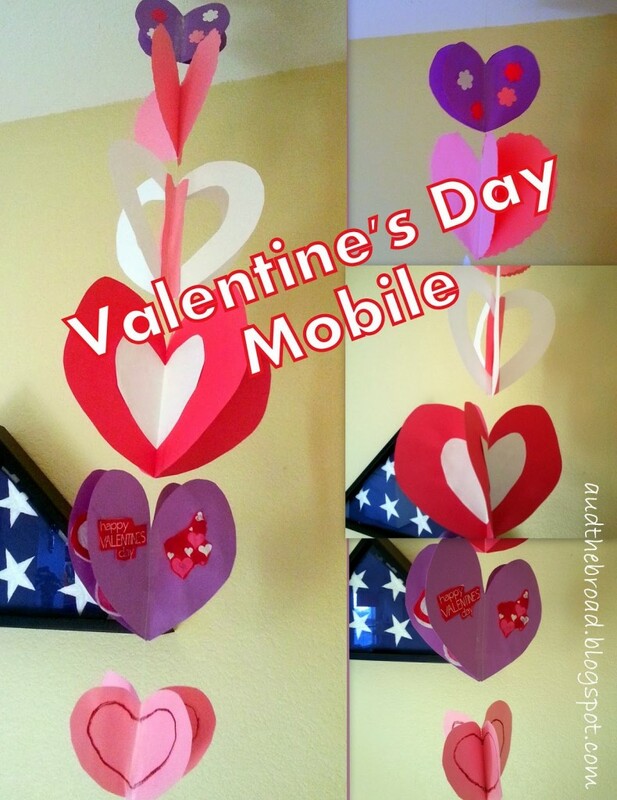 For each heart, fold two pieces of construction paper together down the middle (horizontally or vertically – you choose – I did some of both) and make a sharp crease. Cut out a half heart shape from each folded pair of papers, then open to form a heart with a crease in the middle. Repeat for the number of hearts you want to make. Leave at least 6 inches of thread to hang the mobile before beginning sewing. Using the longest stitches possible, sew a straight line down the crease of each heart pair. Run off about 2 inches between each heart – if the top indentation on the heart is deep you may want to run off more so the hearts do not touch. (this picture is of the Santa, but you get the idea, I hope). (Optional) Tape over the stitching on both sides of each heart pair. I am hoping this will increase the longevity so I can use it for years to come. Tie a loop in the top for hanging. Gently spread each heart pair apart to make an X when viewed from the top. What a cute project!! Thanks for joining us at From The Archives Friday!